Hundreds of people gathered on Michigan State University's campus to participate in the Women's March. 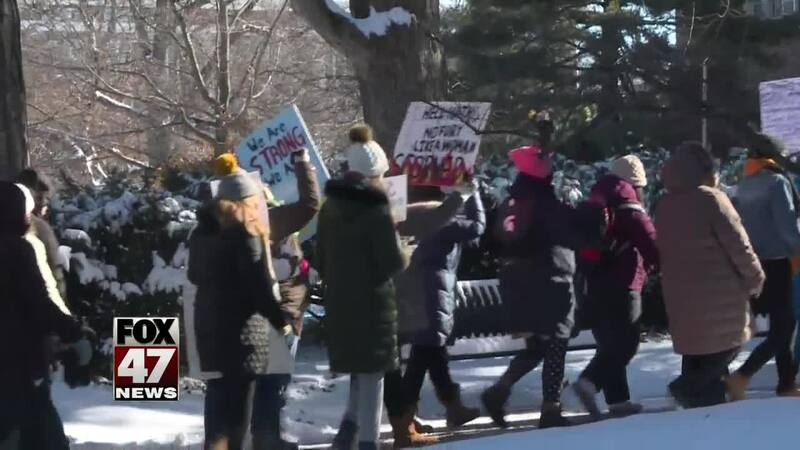 EAST LANSING, Mich. — Hundreds of people gathered on Michigan State University's campus to participate in the Women's March. This comes just months after national Women's March founders were accused of anti-Semitism. "Love trumps hate! Love trumps hate!" the crowd chanted. Some made their voices heard with chants, some chose signs, but everyone at today's Women's March on Michigan State's campus preached unity, and said they denounced all forms of bigotry while they wove their way through MSU. "You're not going to make a change if you're just sitting on your couch not doing anything. You need to go out and support things you believe in," MSU Junior Sydney Herm said. The signs ranged from denouncing President Trump's wall, to the environment, to emphasizing the need to believe survivors. One marcher explained why she chose the quote "women's rights are human rights." "People start to forget that it's for human rights. They start to think that we ar just trying to gain more than men and we are trying to be better but we really just want to be on the same level. We are looking for equality and human rights everyone deserves," MSU freshman Katherine Close said. Many of the people who came out to Sunday's march are students at MSU. They said they wanted to make their voices heard in hopes of a culture change. "Michigan State isn't perfect but this is how we get to a better place. By raising our voices and telling people why we are angry, but also telling people why we care," MSU freshman Emma Anderson said. Others braved the cold because they felt it was important to participate. "Things just don't get done if you don't do anything about it. It's just as simple as that," MSU sophomore Lydia Berge said. Gov. Gretchen Whitmer also spoke at the march. Saturday was the second anniversary of the first Women's March, as many other cities held marches as well.